PMC | Deva Premal & Miten with Manose – The Soul of Mantra – Live! Deva Premal & Miten with Manose – The Soul of Mantra – Live! THE SOUL OF MANTRA – LIVE! Tickets on sale Friday, November 24 at 10:00 AM! In case you had any doubts about Miten and I honoring our Soul Of Mantra – Live 2018 concert schedule, worry no MORE!! We’ve welcomed the incredible gift/challenge of Miten’s heart surgery to lift us up and to fully embrace life in THE HERE AND NOW. Miten will join us on stage at some point, but along with Manose and myself, and our great band (Joby Baker, Danish Rishi and Spencer Cozens) who are ready, willing and able to step up and elevate our voices and our sacred mantras into the stratosphere! I can’t wait! We are blessed with the gift of life, and we come together in celebration of our truth, our lives and loves…plus some great music! Vancouver, BC, November 28, 2017 – Paul Mercs Concerts is pleased to present the following tour date of celebrated chant masters Deva Premal & Miten with Manose, who will be accompanied by Joby Baker & Rishi. Vancouver, BC, November 20, 2017 – Paul Mercs Concerts is pleased to present the following 4 tour dates of celebrated chant masters Deva Premal & Miten with Manose who will be accompanied by Joby Baker & Rishi. Deva Premal & Miten have traveled the world for 20 years, sharing the healing power of mantras. The unique blend of Deva’s voice, the ancient Sanskrit chants, Miten’s soulful songs and Manose’s sacred flute offers audiences an evening of peace and transformation. Nepalese bansuri maestro, Manose – acknowledged as among the world’s best – accompanies as always Deva Premal & Miten both on flute, vocals and various instruments, including ukulele. With a large, faithful and constantly expanding audience – from New York to Moscow, from Paris and London to Buenos Aires and L.A, Deva Premal & Miten show us, year after year, that in the spirit of music and mantra, humanity is able to unite. 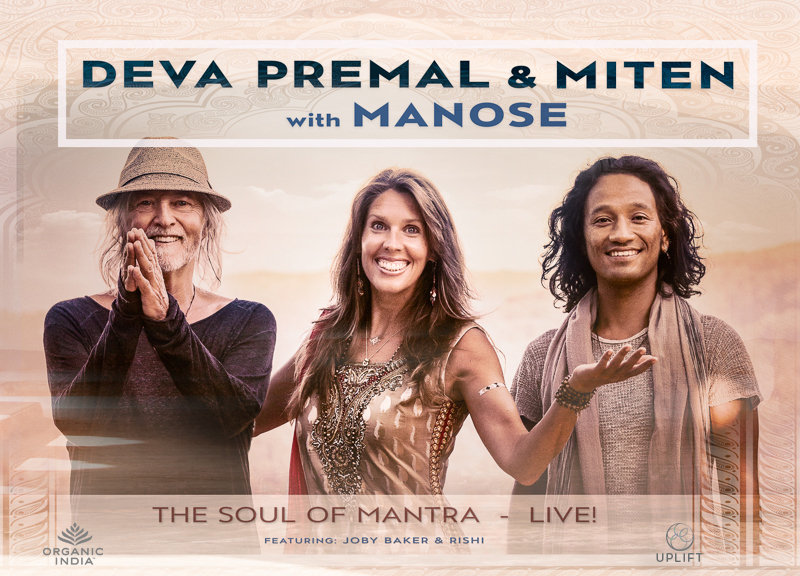 Deva Premal & Miten with Manose’s 2018 Soul of Mantra – Live tour is sponsored by ORGANIC INDIA in association with UPLIFT. Seattle tickets available at ticketmaster.com, 1-800-745-3000, the Paramount box office (M-F, 9AM – 6PM), and at Neptune box office 90 minutes prior to show time. Victoria tickets available at tickets.uvic.ca, 250.721.8480 or the ticket centre. Vancouver tickets available at chancentre.com/tickets, 604-822-2697 or the ticket office.